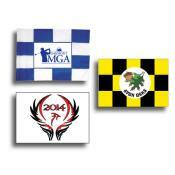 High quality custom practice greens flag, long life, quality Dacron material. The Dye Sublimation process heat sets UV protected inks directly into the Dacron material to achieve the highest quality print capabilities. This process transforms the white Dacron material into the colors of your design, penetrating over 60% of the fiber, enabling a reverse image show-through, resulting in a Great looking flag. Note: Editable EPS, JPEG, PDF files preferred. 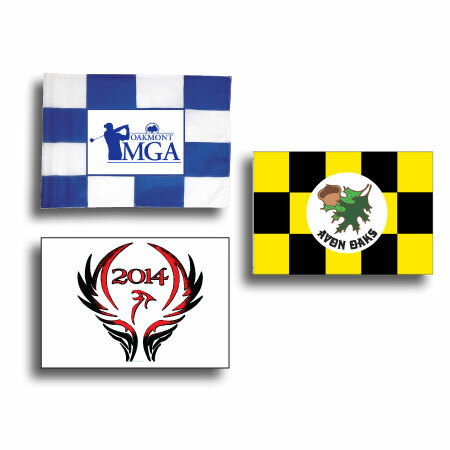 Please send artwork to flagart@markersinc.com for review.